Flip 6 Coins, If 4 Or More Are Tails, The Defending Pokémon Is Now Paralyzed, You Can Switch It With Any Pokémon On The Opponents Bench. Bear Hugger Is Now Asleep. 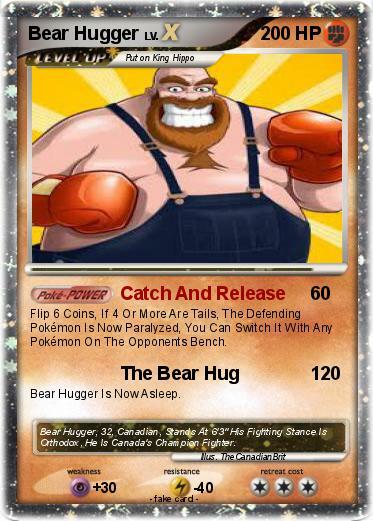 Comments : Bear Hugger, 32, Canadian, Stands At 6'3" His Fighting Stance Is Orthodox, He Is Canada's Champion Fighter.